Two to choose from....... I now have two pair of shoes to choose from when I head out each morning for my run. I got a second pair of running shoes this past Friday so I can check them out. This will give me a second pair of shoes to alternate with my current shoes. The first leg of my running journey was in a pair of New Balance M767SB. These were my first running shoe and carried me through many a mile of training, and my first 5k, 10k, and Half Marathon. These shoes were tired and I retired them to be casual everyday shoes just a day or two following my Half Marathon. I had racked up over 450 miles on those shoes and they were starting to hurt me. When retiring those shoes I went back to the running store and purchased myself another pair of New Balance, but this time went with the newer model MR768ST even though they had a pair of the same ones that I had just run so many miles in..... the new model just felt better. I went ahead and purchased a new pair of insoles as well to go with the new shoes. I got these shoes this past Friday. They are a bit narrower than all my other running shoes so at first I was a bit worried since I have a wide foot. Saturday I went out for a 10k training run but opted for my current running shoes because of the distance. I didn't want to run that far in a new pair of shoes. Sunday, I put them on for the first time to go for a walk with my wife. They felt great as far as a pair of shoes fitting, and I was looking forward to see how they felt walking and then running. We didn't walk far because of my wife's feet starting to hurt, but I was happy that my feet weren't hurting. My knee did start to hurt a little bit, but I am not sure if that was the shoe or not. This morning I took them for their first test run. I went out for only 2 miles to get a good feel for how they felt without getting too committed in case they started to hurt me. The first mile they felt absolutely great, and the second mile my feet felt great but my right knee started to hurt a bit. I, again, am not sure if it is the shoes, it may be because I am used to running with insoles and I do not have insoles for these shoes. I may try to move my insoles from my other shoes and see if they will fit in these shoes. That will give me a good indication on how these shoes are going. I will keep you posted! Dude, the shoes may be great but the website www.runlikeananimal.com is pretty negative. I'm guessing they're aiming for an elitest segment of the market, not the guys like me trying to eak out a 12 minute mile. As always though, I enjoy reading your blog! I'm chillin' in Pranburi, Thailand at the beach. We have a crazy vacation with family and are doing a week here, 3 days in Bangkok, then another 9 days at a different beach. I'm working on some writing I'm doing, so it's a working vacation. I meant to ask you if you had treated yourself to a new pair of shoes yet post half marathon. It's always a roll of the dice on different brand/model shoes you haven't had/tried before. I was nervous about the Mizunos I had bought a couple of months ago, but they have worked out pretty well. I'm typically an ASICS guy. Hopefully the Pearl's will end up serving you well. Did you have any trouble from the nasty storm the Atlanta-area had last week? That hit the day after we drove through and would have been about the same time we rolled through. William - I know what you mean - I kinda thought that was their aim as well..... and I am no elite runner! Hope you continue to enjoy your time away! Rick - I am still trying to work out these Pearl's. I have moved my old inserts from my original shoes and will see how that goes. As for the weather here in Atlanta.... we are far enough out of Atlanta that we just got some heavy storms and lots of wind. It has really cased havoc on downtown though.... glad you made it through the day before. William, that's the job in my deam , travel and working in the same time. The content of your blog is exactly what I needed, I like your blog, I sincerely hope that your blog a rapid increase in traffic density, which help promote your blog and we hope that your blog is being updated and placed can always be richer and more colorful. Nice choice!! 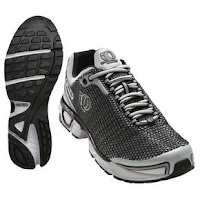 Not any particular brand is my favorite, I believe on comfy, flexible and durable running shoes.